Summer 2016 Skytech Advantage Magazine now available! ADVANTAGE MAGAZINE SUMMER EDITION NOW AVAILABLE! A new Skytech Advantage magazine is now available! 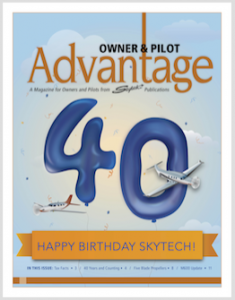 This special birthday issue features information about the history of Skytech, mistakes to avoid when purchasing an aircraft, 5 blade propellers, and more. Click here to read the latest issue. This entry was posted on Wednesday, July 27th, 2016 at 9:10 am. Both comments and pings are currently closed.